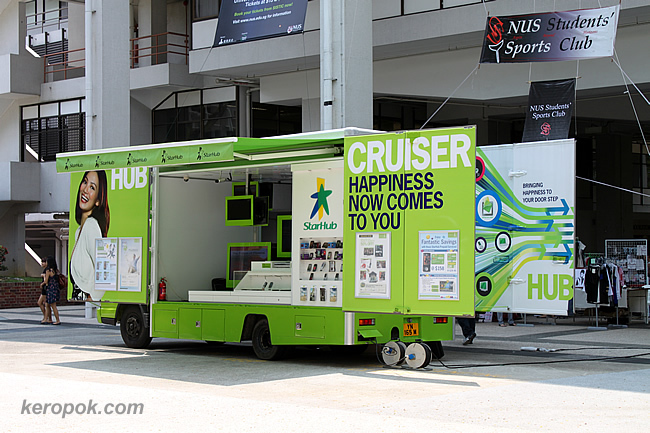 I always wondered how the green telco's Hub Cruiser looked like. Finally I got to see it today! Colleagues and I saw that there was huge screens showing Cable TV channels. We wondered if those were live shows. Maybe it was a playback. Colleague who is a HBO fan said, why haven't they brought in HBO in HD yet?! Anyone out there who are addicted to Cable TV shows? What's your favorite cable TV channel? Wow, cool idea man. Mobile sales counter. ya, so foldable! like transformers. maybe it will drive itself away after the roadshow! I like the words, " Happiness now comes to you" How nice! I was not happy. Because the phone I want is not there yet. I want the HTC Hero! hehe. Waiting for it to be solved as a plan at the local telcos!